Did conservatives learn the wrong lesson from losing to Obama the first time? His personal shortcomings haven’t disappeared. During the course of writing about national politics, especially the 2012 presidential election, I have noticed a continuous theme in comments from Pajamas Media readers, comments from other conservative web sites that have picked up my columns, and personal emails from politically active conservative friends and associates commenting on my writings. All three sources of comments shout loud and clear the reason why many conservatives do not support Mitt Romney for the 2012 GOP nomination. This last argument has been voiced again by Republican moderates as a good reason to support Romney in 2012 and of course was used by those same moderates in 2008 to garner support for McCain during the primary process. The argument worked and McCain was initially popular with independent voters. However, in the fall of 2008 independents fled from John McCain — some would argue because Sarah Palin as McCain’s running mate scared them off, but others would say she attracted conservatives and fired up the base. The truth is both arguments are correct and the voter groups partially canceled each other out, helping to ensure Obama’s victory. Now looking to the 2012 election, independent voters hold the key to defeating President Obama, and any Republican nominee must be somewhat mainstream to attract them or risk going down to a certain defeat. But for conservatives to use “RINO” McCain’s inability to attract independents in the 2008 general election against Mitt Romney and thus withhold their support is flawed and dangerous thinking that will assist in President Obama’s re-election. 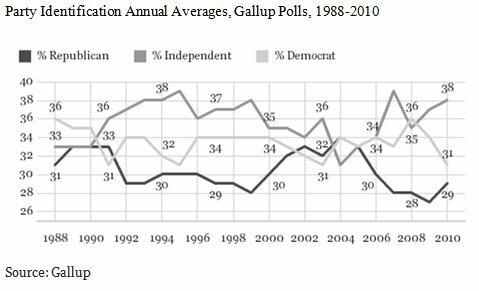 Independents, according to a Gallup poll, now comprise 38% of the electorate. Other polling finds they are turning against Obama, and the Republican nominee must be someone to whom they can run. But if only a “true conservative” is acceptable to the base in 2012, one who can win the GOP nomination and has a reasonable chance of defeating President Obama — that person better rise up fast because time is running out to organize and finance a campaign against an incumbent president who will raise close to $1 billion. Besides, can anyone even define a “true conservative” these days? For example, could President Ronald Reagan, who granted amnesty to three million illegal aliens in 1986, even win his party’s nomination in 2012? Romney is being dogged by the shadow of John McCain. This explanation also sheds light on why Romney is not catching on with the base and subsequently why his polling and fundraising are stalled and lackluster. There is no doubt that Romney is beatable for the GOP nomination, but someone has to step up and actually beat him. Just the idyllic concept of a “true conservative” candidate does not cut it. Enter Texas Governor Rick Perry. An informed source says Perry will make entry into the presidential race “within the month.” Is this three-term governor of Texas the man on the great white horse who can ride in and rescue the base from Romney the “RINO”? The answer to that question will soon be obvious in polls and fundraising. However, Governor Perry will have an even more toxic shadow than the one following Mitt Romney. This shadow will follow Perry throughout the primary process, then grow even larger during the general election, if Perry makes it that far. This is the shadow of a former Texas governor, President George W. Bush. Remember during the 2008 election how Senator Obama waged his campaign more against President Bush than his actual opponent, Senator John McCain? In 2012, if Governor Perry is the nominee he will be Obama’s George W. Bush version 2.0. Do Republicans really want to make it that easy for Obama’s campaign message machine? The truth is Rick Perry is not George W. Bush, but a billion dollars of Obama’s campaign money can buy a lot of TV commercials convincing voters or making them at least think how Governor Perry could be George W. Bush the sequel. The political shadow of John McCain is now hovering over Romney and George W. Bush’s shadow will soon be dogging Perry. Therefore, it is imperative that both men find a way to blot out these shadows before voters are spooked. ALSO READ: Is Romney Our Best Choice? Myra Adams is a media producer, writer and political observer, who served on the McCain Ad Council during the 2008 McCain campaign, and on the 2004 Bush campaign creative team. Her columns have appeared on Pajamas Media, The Daily Caller and as a co-writer on The Daily Beast. Myra’s web site TheJesusStore.com contributes all profits to Christian charity. Follow @MyraKAdams on Twitter.